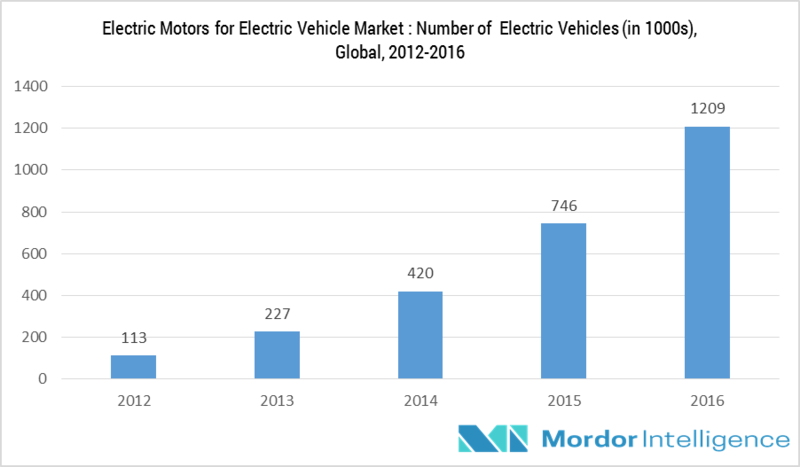 The Electric Motors for Electric Vehicles market is forecasted to register a significant CAGR of 15% over the forecast period. The market is expected to be USD 3.952 billion in 2017. New Economy Average Fuel Economy (CAFÉ) standards are likely to encourage the market entry of electric vehicles. CAFÉ norms dictate the models produced from 2012 to have a fuel economy of 29.58 mpg which is an increase of 16% from the previous fuel economy standards. European countries have also passed different policies, like Elektromobilitat Model Region Hamburg, the testing of diesel hybrid buses on lines in Germany, Gronn Bill in Norway and Copenhagen electric in Denmark to promote electric vehicles. China is also taking some aggressive steps to become the market leader in EVs as well. In 2017, the City of Beijing announced plans to transform its entire taxi fleet to electric propulsion. Thus policies of government play a huge role in promoting electric vehicles. The results are starting to show in European countries where electric vehicles have reached a significant portion of the total vehicle population. In years to come, China and India are positioned to take the leading role in electric vehicles, owing to the supporting government policies. A shortage of EV charging stations has hindered the adoption of these vehicles, which further has restricted the usage of electric motors for electric vehicles. As the EV industry does not have any overall set standards on the charging power output, companies are increasingly involved in building charging equipment based on their standards. Also, with setting standards, it is also very important to establish charging stations, which is again a cost intensive affair. EVs are mostly used for public and private transport and have a limited range of charging. Charging stations ensure that end-users who travel long distances can charge their vehicles en route. However, setting up charging stations is a lengthy process and is a major challenge to the adoption of such vehicles. The costs associated with charging technology are high and thereby the OEMs are providing automobiles integrated with the wireless charging technology. The cost of ownership and affordability issues also hinder the demand for the wireless charging integrated electric vehicles market. However, several developments and enhancements are being made in the wireless charging technology space to meet the product associated affordability issue as well as solve the issues associated with charging stations. PLUGLESS is one of the first wireless electric charging solutions in the automotive market launched in the USA. The pricing of their wireless charging system offerings is listed below to have an idea of the costs of the wireless charging technology in the market as a whole. February 2018: Nissan intends to add six electric vehicles to the portfolios of the Nissan and Infiniti brands over the next five years. February 2018: Indian based Bharat Forge has inaugurated a R&D center in the UK which will be developing components and sub-systems for electric vehicles. Major Players: CONTINENTAL, SIEMENS AG, TOSHIBA CORPORATION, HYUNDAI MOBIS, YASKAWA ELECTRIC CORPORATION amongst others. Provides latest insights into the Global Automotive Market. Gives a detailed analysis of the competitive landscape in the automotive industry segmented by vehicle type, by type, by motor type, by application and by geography. Analyses the market scenario with the help of Porter’s Five Forces Analysis.